The Jumbo Glacier, the proposed site of the Jumbo Glacier Resort. KeepItWild. No reuse restriction found. In 1991, Glacier Resorts Ltd. submitted a proposal for the development of the Jumbo Glacier Resort, a year-round ski resort on the Jumbo Glacier in the Purcell Mountain Range of British Columbia. After a few years of review, the British Columbia Provincial Government approved Glacier Resorts Ltd.’s proposal in 1995 and provided them with the appropriate permits to move forward with development of the area. However, many different groups are openly opposed to the development of the ski resort. The Ktunaxa Nation in particular is against the Jumbo Glacier Resort as the Jumbo Valley (known to the Ktunaxa peoples as Qat’muk) is a sacred place where the Grizzly Bear Spirit (one of the deities central to their religion and belief system). Many other groups including Wildsight and Patagonia have also openly spoke out against the development of the Jumbo Glacier Resort as it will could irreparably harm critical grizzly bear habitat. This map shows the location of the Jumbo Valley in the West Kootenay region of British Columbia. KeepItWild. No reuse restriction found. In 1991, Glacier Resorts Ltd. (GRL) proposed the development of a new ski resort, to be called Jumbo Glacier Resort, in the Jumbo Valley of British Columbia. This would be the first year-round ski resort in North America, consisting of twenty-two chair lifts, providing access to four glaciers. Upon receiving the proposal, British Columbia’s provincial government expressed its initial support for the province. Before long, however, the Ktunaxa Nation, an Indigenous group local to the region, expressed their opposition. The Ktunaxa peoples claimed that the ski resort would have detrimental impacts on British Columbia’s grizzly bear population. Furthermore, the proposed ski resort would destroy land that is sacred to the Ktunaxa Nation. However, the provincial government accepted the project proposal and put it through to the land use review stage, which was carried out by the Commission on Resources and the Environment. This review ended with the approval of land use for the proposed ski resort. The project then moved into the environmental assessment stage, a process carried out by the provincial Environmental Assessment Office. This process lasted years, ending in 2004 with the issuance of an Environmental Certification for GRL. Shortly following this, the Shuswap Indian Band, another local Indigenous group, expressed their support for the Jumbo Glacier Resort. In 2012, Jumbo Glacier Resort was designated as a Mountain Resort Municipality, with the council consisting of a mayor and two councillors. Soon after this, the Ktunaxa Nation submitted a petition to the Supreme Court of BC for the cessation of the resort’s development. Their petition, however, was dismissed. After years of protests by local people and complicated disputes between stakeholders, as well as years of inactivity, GRL finally began development of the resort in the fall of 2014 just weeks before the expiration of their Environmental Certification. However, the provincial Minister of Environment concluded that the amount development was not sufficient according to the terms laid out in the Environmental Certification. The Ktunaxa Nation then approached the federal Court of Appeal, in attempts to overturn the decision made by the Supreme Court of BC. However, their case was, once again, dismissed. The Supreme Court of BC then, in August of 2018, reissued GRL’s Environmental Certification, allowing development on the resort to move forward. The proposed site of Jumbo Glacier Resort is in the Jumbo Valley of British Columbia. The valley lies in the Purcell Mountains of the West Kootenay region of the province, approximately 55 km west of Invermere. The project site also lies in the middle of important grizzly bear population. The development of the resort has the potential to fragment the larger bear populations into smaller populations, which would put the smaller populations at risk of extirpation. Since 2012, the area has been designated as the Jumbo Glacier Mountain Resort Municipality (JGMRM). Despite having no infrastructure and no population, the JGMRM has received over $800,000 from the province since its creation, which has accounted for 97.7% of its revenue. Since the reissuance of the Environmental Certification, GRL has development rights for the project site. There are three major indigenous groups in the area, each with overlapping land claims. The Ktunaxa Nation has occupied the region for approximately 400 generations. Qat’muk the area known in English as the Jumbo Valley, is a sacred place for the Ktunaxa peoples, as it is home to the grizzly bear spirit, a figure central to their religion. The Sinixt Nation, an Indigenous group considered extinct by the federal government since 1965, considers the area to be sacred as well. The area is known to Sinixt peoples as “piq-s-mx-ikn”, meaning “White Grizzly Bear” in English. The Sinixt Nation has acknowledged that their land claims overlap with other Indigenous groups in the area. However, they do not see the overlap as divisive, but rather as an opportunity to strengthen resistance against outside groups that threaten the sacredness of the area. Finally, the Shuswap Indian Band is another local Indigenous group with land claims overlapping with the Ktunaxa Nation and Sinixt Nation. The Shuswap Indian Band is, geographically speaking, the closest Indigenous group to the proposed ski resort. The Shuswap Indian Band has publically denied the validity of Ktunaxa Nation’s land claim for Qat’muk. As the area is designated as a Mountain Resort Municipality, the mayor and councillors have the authority to pass bylaws that govern the development process of the Jumbo Glacier Resort. In May of 2013, the JGMRM passed its first bylaw permitting the commencement of construction. Various branches of government such as the Ministry of Forests, Lands, and Natural Resource Operations; the Commercial Alpine Ski Policy; and the Environmental Assessment Office have been responsible for approving the proposed ski resort, as well as carrying out land use and environmental reviews. These groups have provided GRL with the permits necessary to begin the development of the resort. The Ktunaxa Nation, one of the major Indigenous groups in the area, consider the Jumbo Valley, known to them as Qat’muk, a sacred area. Qat’muk is home to the Grizzly Bear spirit, which is a central figure in their religion. The development of a ski resort, as well as the presence of humans in the area, would drive the Grizzly Bear spirit away, which would leave to the inability of the Ktunaxa peoples to achieve spiritual fulfillment. After having their petition to cease development of the resort dismissed by the Supreme Court of BC, the Ktunaxa Nation took their case to the federal Court of Appeal and claimed an infringement of subsection 2a of the Canadian Charter of Rights and Freedoms which is related to the Freedom of Religion. According to the Court of Appeal, Freedom of Religion is not extended to “protection of the object of belief” and so their appeal was, yet again, dismissed. The Sinixt Nation is another Indigenous group in the area, who also considers the Jumbo Valley, known to them as piq-s-mx-ikn” (“White Grizzly Bear” in English), a sacred area. The Sinixt Nation has publicly stated their opposition to the development of the Jumbo Glacier Resort. Local residents and business owners can also be considered affected stakeholders. 90% of residents in the towns and municipalities surrounding the Jumbo Valley were opposed to the development of the ski resort. 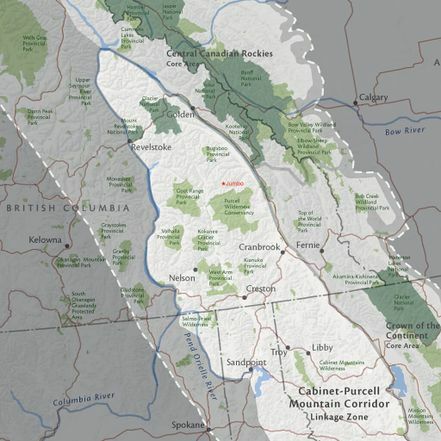 Although developers claim that the resort will boost the local economy and create jobs, the Ktunaxa Nation commissioned an economic assessment of the project which concluded that the resort would not benefit the local economy, and would instead steal business from the other local ski resorts. Glacier Resorts Ltd. (GRL) is the company that has spearheaded the development of the Jumbo Glacier Resort, with Oberto Oberti, a Vancouver based architect, taking the main lead. GRL would reap the economic benefits of the ski resort. However, the only thing tying GRL to the Jumbo Valley, specifically, is their desire to offer year-round skiing, which would be possible in the Jumbo Valley. However, if they were to build a ski resort elsewhere, they would still receive the economic benefits. Environmental NGOs such as Wildsight, Jumbo Creek Conservation Society, and Patagonia have expressed their opposition to the development of the Jumbo Glacier Resort, due to environmental reasons. The project site lies in the middle of important habitat for the Purcell-Selkirk grizzly bear population. The development of the resort has the potential to fragment the bear population. Cutting off the smaller populations from the larger one would likely significantly reduce the chances of the smaller populations to survive. These environmental NGOs are actively campaigning against the development of the resort. Furthermore, Wildsight and Jumbo Creek Conservation Society were granted intervenor status in the Ktunaxa Nation v. British Columbia Court of Appeal case. Government: Over the past 27 years, the government (both provincial and federal) has played a massive role in the outcomes of this conflict. Various branches of government has been responsible for reviewing and assessing the situation, and deciding whether or not to issue development permits as they see fit. This issue seems to be divisive amongst government officials, with some supporting the project and others opposing it. With the exception of government officials who may be residents of the region, their livelihoods do not depend on the outcome of this situation, and they are therefore an interested stakeholder, rather than affected. GRL’s incentive for building the Jumbo Glacier Resort is the economic gains that would come with year-round skiing. However, it seems as though they are ignorant to the detrimental effects of the resort’s development. Despite the lack of support from local residents, two local Indigenous groups, and some members of the government, GRL continues to trudge forward with the project. The project’s approval process has been ongoing since 1991. Despite being granted development rights and an Environmental Certification, GRL has made very little progress over the past 27 years. Legal disputes between stakeholders have been constant over the years and has lead to a clear divide between stakeholders. Even the government seems to be divided on the issue. On one side, the provincial government supports the development of the resort, and has been dismissive towards the concerns of local Indigenous peoples. However, some branches of government seem to oppose the development. Early on in project’s approval process, GRL made a Freedom of Information request to the provincial government which revealed correspondence between government officials regarding their plans to prevent the development of the Jumbo Glacier Resort from moving forward. Almost a decade later, in 2009, the provincial government signed an engagement agreement with the Ktunaxa Nation which would grant the Ktunaxa Nation $1.65 Million over 3 years, to help them engage the province on land and resource use decisions within their traditional territory. Meanwhile, the provincial and federal government has continuously rejected their attempts to protect their sacred lands. It would be safe to say that this issue is not about a ski resort anymore. It is about the large issue of the ignorance of Indigenous rights and land claims by governments. Since the beginnings of the project, the voices of local Indigenous peoples have been consistently ignored. The first notable instance of this was during the initial land use and environmental reviews, in which the parties carrying out such assessments claim that all local stakeholders were involved. However, Ktunaxa Nation denies that they were ever properly consulted. In 2010, Ktunaxa Nation published their Qat’muk declaration, outlining their claim to the land, as well as the ways in which Qat’muk is considered sacred. The developers of the resort denied the validity of this declaration, claiming that it was “made up”. Later on, Ktunaxa Nation approached the Supreme Court of BC petitioning to cease development of the ski resort that would have detrimental impacts on their sacred and traditional land. Their petition was dismissed. This pattern of suppressing Indigenous voices continued when Ktunaxa Nation approached the federal Court of Appeal, claiming an infringement of their Freedom of Religion, as outlined in subsection 2a of the Canadian Charter of Rights and Freedoms. Their case was, again, dismissed for a number of reasons. First, the federal court argued that religious freedom does not extend to “protection of the object of belief.” Second, the court argued that claims of infringement of Freedom of Religion requires a substantial “interference with the claimant’s ability to act in accordance to his or her beliefs”, which the court determined was not the case here. They also argued that the “impact on non-indigenous people of refraining from building the ski resort is not particularly burdensome.” Finally, the court concluded in Ktunaxa Nation’s case that subsection 2a should not be used to restrain behaviour of those who do not share Ktunaxa beliefs. However, the Canadian Charter of Rights and Freedoms was created to prevent state action regardless of the actors beliefs, thus deeming their last point as invalid. All of the federal Court of Appeal’s reasons for dismissing Ktunaxa Nation’s case are a reflection of the courts colonial and Eurocentric ideas of religion. They are labelling Ktunaxa Nation’s claims as invalid as a result of their lack of understanding of Indigenous religion. The government has shown it’s unwillingness to protect sacred Indigenous lands, without acknowledging that these lands are to Indigenous religion as sacred buildings (ie. churches, Mosques, etc.) are to many other religions. Throughout the entire project approval process, local Indigenous groups have been required to conform to settler-colonial ideas and forms of governance. They have had to plead their cases in English, a language that is not native to them, as well as argue for the legitimacy of their religion to a government that has no understanding of Indigenous religion. Ktunaxa Nation is not the only group in this situation that has been subject to such colonial violence. The Sinixt Nation is the other Indigenous group that is opposed to the development of the Jumbo Glacier Resort. However, they have a significant barrier preventing their political participation on the issue: they have been considered extinct by the government since 1965. Their inability to actively participate in an issue that could have detrimental impacts on their livelihoods perpetuates their suppression, and silences their voice, and weakens the voices of the Ktunaxa peoples. GRL, as well, has participated in the suppression of Indigenous peoples. Throughout the development process, they have continuously denied the opinions of opposing Indigenous groups. They have, however, had an ongoing partnership with the Shuswap Indian Band, the local Indigenous group that has shown support for the project for economic reasons. This is not, however, a reflection of GRL’s respect for Indigenous peoples. Instead, it is a reflection of their prioritization of money and economic benefits over the spiritual well-being of Indigenous peoples and well-being of ecologically-sensitive ecosystems. The situation in British Columbia’s Jumbo Valley is reflective of a much greater issue, regarding a suppressive political climate in a country that claims to be working towards reconciliation and reparation with Indigenous peoples. Many of the conflicts that have been central to the governance of the Jumbo Valley over the past 27 years are a result of improper or incomplete stakeholder analysis and consultation. In particular, it is the voices of the affected Indigenous groups that have not been taken into consideration. As peoples that have occupied the area for thousands of years, their opinions should be prioritized instead of suppressed as they have been in this situation. These are peoples that have occupied these lands for generations, with very minimal impact, as they have knowledge of the land that has allowed them to do so. Ignorance to Indigenous knowledge and ideologies is, however, not unique to this situation. It is, instead, a product of settler-colonialism and colonial violence. Solving this issue requires total reconciliation between governments, as well as a major shift in the dominant political climate of Canada. It involves providing Indigenous peoples with a platform upon which they can share their knowledge and guide decision making, especially when decisions will so deeply affect their livelihood. However, changing the attitudes of law- and decision-makers is a process that could and likely will take decades. In order for such a shift to be well-received by the public (specifically, folks who have not been affected by colonial violence), it must begin with smaller actions. In a situation like that occurring in the Jumbo Valley, it could begin with not allowing Eurocentric governments to guide consultation with Indigenous peoples. It cannot be considered a fair and thorough consultation with Indigenous peoples if the party carrying out the consultation is a government that has historically silenced and suppressed those Indigenous groups, as the responses of said groups may be influenced by intimidation. Instead, third parties who will be in no way impacted by the outcome of the situation should carry out consultations. Even then, however, it would be rather difficult to find such a group that is entirely non-partisan. As for the development of the ski resort, there is likely no way of continuing development in such a way that will not cause irreparable damage to the livelihoods of affected stakeholders, as well as further damage to the relationship between Indigenous peoples and governments. Furthermore, it is economic gain that developers are striving for and that is something that is not directly tied to the specific location. The best way to move forward would be to cease development of the resort in the Jumbo Valley, and to potentially find an alternate location in which the resort would have a lesser cultural and ecological impact. Moving forward, it is not wise to dwell on the damages this situation has already created, as they are already far too severe and plentiful, and likely irreparable. Instead, those involved should strive to find a solution that will prevent, or at least minimize future damages. This conservation resource was created by Kelli Stenson. It has been viewed over 0 times. It is shared under a CC-BY 4.0 International License. ↑ 1.001.011.021.031.041.051.061.071.081.091.101.111.121.131.141.151.161.171.181.191.201.211.221.231.241.251.26 Glacier Resorts Ltd. (2018). Jumbo Glacier Resort Approval Process: A History(Rep.). Glacier Resorts. Photo Credit: Wikimedia Commons. Public Domain.